It was actually during one of those rides I had the pleasure of riding a 1200R. 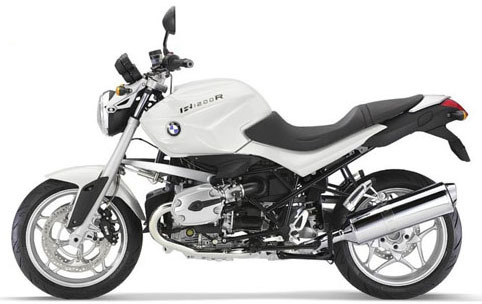 That bike made me think twice about my BMW choices and the Beast. Even so, I was able to resist the urge to trade up (or over) and settled into a happy existence with the GS. Well, as happy as it can be considering there isn't a lot of time to ride and I have no riding buddies. Drat! I dropped the Beast off at BMW Motorcycles of Western Oregon, Tigard (http://www.bmwor.com/) last week for some old recall issues and it's 12k service. I hate taking the bike in for service for a few reasons. The main being the price and the second being that a few years ago BMW of Western Oregon had this great service called LOANERS. I could just drop my bike off and ride one of theirs for the day while mine was getting serviced. It gave me a chance to ride a bike I normally wouldn't even think of and also to avoid the agony of trying to find a ride from my country home to the Tigard area. I wanted to take a moment and offer praise to BMW of Western Oregon and specifically to Ben in the service department. Ben is one of the few reasons I will take my bike back to BMW for service when I know there are other people and places that can work on the bike for lesser amounts. Ben was courteous, helpful, and most importantly to me, entertaining. He was a cool cat. I had mentioned to Ben that I was thinking about selling the Beast and he took the time to have a conversation with me about the bike that was very helpful in making my final decision. He even mentioned I was thinking about selling to someone on the sales floor who kindly called and told me about BMW's options. I could sell them the bike outright or I could put it on consignment. Great options for someone who is looking to sell a bike as soon as possible! I'm in no rush to sell but it's good to know there are options. Lucky for me the day I picked up the bike the sun was shining in Portland and the weather was a balmy 54 degrees. (Okay, not balmy but a girl can dream, right?) I got my bill from Ben and walked to the front cashier to pay and was greeted by name. (Freaky and cool at the same time.) I tried to get them to take my firstborn child instead of my visa card but it was a no go (doesn't hurt to ask). When I got back to the service area my bike was waiting outside, cleaner than it had been when I brought it in. I bid ado to Ben and climbed on board the Beast. We rode away poor but happy. And we rode and rode thanks to the great day! Now, I must tell you that BMW of Western Oregon is one of two places I take my BMW. The other place is hard to beat since the service guy (who actually works on my bike) and parts guy always take a few minutes (and usually more) to chat me up and they both give me a discount almost every time. They offer free advice and are my "go to" guys. If I could marry them I would. But, BMW of Western Oregon is a place I'm warming up to. Being called by name is a great bonus and having friendly staff in the service area is awesome (they haven't always been that nice). I find walking through the store to pay my bill has the exact effect I'm sure they are going for...I'm checking out other bikes and the new shirts, eying the newest jackets and dreaming of some new straps. And, even though I know that's a ploy, I still enjoy it because normally I wouldn't take the time. The only thing I'm not keen on regarding this service trip is that after I bought a new battery (at least they tested the old one and informed me so I wasn't stranded) they didn't reset my clock. I can do a lot of things by myself. Reset my BMW clock isn't one of them. Last time I had service there they did reset the clock, so maybe it was an oversight. But, even so, for what I paid for the service I'd expect to hop on the bike and have a clock that showed the correct time (and maybe made waffles). Overall I offer a big KUDOS to BMW of Western Oregon-Tigard for hiring people who know their stuff, who take the time to make you feel welcome and who remember your name. The Beast and I thank you. Moto Gear: What works? Help! First Ride of 2011: Rain!